Check Out Our Top 10 Women’s Golf Shoes Reviewed. A lot has changed since the Mary, Queen of Scots invented the caddy while playing golf in her ankle length gowns, corsets and leather boots in the 1500’s. And no longer are golf shoes attached to metal spikes that screw into the bottom of the shoe like they were in the 1800s, which, believe it or not, stuck around until the 90’s. In former years, golf footwear had a stock design and a standardized technology with a sole purpose of keeping the player from sliding around during a swing. Now, there’s a multitude of factors that go into designing a shoe, creating nearly endless possibilities for what can go on your feet during a round of golf. If you’ve ever been to the PGA Merchandise Show in Florida, you know that the golf merchandise industry is massive. There’s hundreds of booths— more than 300 apparel booths — with thousands of products all claiming to be the best and your game falls short without it. While that sounds nice, it’s all about finding that happy medium of comfort and performance when finding the perfect shoe. But if you determine what your priorities are and decide what you’re willing to sacrifice, you can find THE shoe that could even offer improvement to your game as well. Having a steady, comfortable base can only help you, not hurt you! Searching online, it can be hard to find informational articles on women’s golf apparel and especially if you don’t know what to look for, it can be even harder. If you notice in most golf merchandise stores and online, the selection for menswear can far outweigh womenswear. 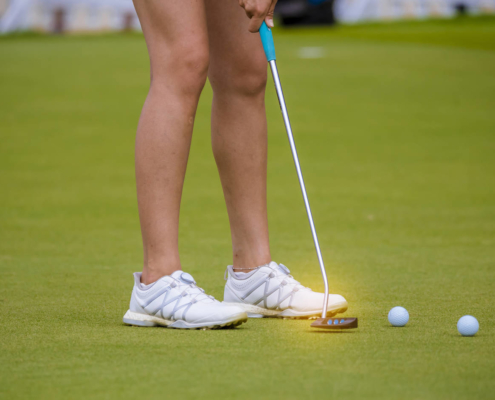 However, with more women getting involved in the game, and with women professionals becoming more prevalent, the industry is following suit and there is actually quite a variety in different types of shoes, depending on what kind of a golfer you are. What kind of environment am I playing golf in? Whether you’re playing in rainy Seattle, or hot, dry Palm Springs, it’s crucial to think about where you will be playing golf when making a shoe purchase. You can’t predict the weather unfortunately, but you can prepare for what the weather tends to look like in a specific area. For example, at Nelly Korda’s most recent win in Australia at the ISPS Handa Australian Open, her focus was comfort, wearing “spikeless” rubber soled shoes with a wide sole, reminiscent of a tennis shoe. For summertime in Australia, she did not require a need for extra stability or waterproofing from a muddy, slippery terrain. If comfort is a top priority, spikeless shoes (even with this unique velcro feature) would be the best option, but only if wet terrain is not in your future. Spikeless shoes are notorious for slipping and sliding— not something we want! However, they are perfect for the kind of player who isn’t interested in ripping them off as soon as they walk off 18-green, as spiked shoes can sometimes create discomfort over a long period of time, no matter how high-end they can be. To contrast the spikeless summer shoe option, at the RICOH Women’s British Open in Lytham Saint Annes, Britain, Korda wore a shoe consisting of spikes and the BOA crank mechanism, as opposed to regular laces. This format offers stability in unstable weather conditions, and the crank keeps her shoes tight and secure for the entire round. According to a lab study by BOA and adidas, this technology, compared to laces, keeps the midsection of your foot secure, while keeping any water or dirt from entering the shoe, without the friction of individual laces digging into the foot. This is a great option for the avid golfer playing in adverse conditions, or for someone who simply finds importance in reliability and support. How often am I playing? It seems that there’s a common theme with shopping for golf shoes: comfort vs. durability. But it’s a fair question! You can’t wear a knit, spikeless shoe that looks like a walking shoe and expect it to handle a large amount of use, walking through bunkers, mud, etc., without any issues. So yes, while it’s the most comfortable shoe type on the market, it wouldn’t compare to an all-leather, spiked, waterproof shoe (FootJoy is one of the best in this category.) These are polar opposites when looking at the market, but there are options to find that “in-between,” if you’re an avid player who needs dependable footwear. When thinking about durability, an ideal material that should be considered is leather. It is easy to clean, you won’t find sand and dirt sneaking into the shoe like you would with a cloth or knit material. However, you can still find a durable, leather shoe that is comfortable. Nike offers a great selection of women’s golf shoes modeled after the popular Nike Roshes, a casual shoe. They are very comfortable, but also can withstand a decent amount of playing time — and they’re waterproof! If you have a larger budget, Ecco is excellent — considered to be one of the most comfortable brands in the industry, Ecco is made from durable, soft leather, with spikeless bottoms offering little to no sacrifice. Although, if you’re simply a weekend warrior who prefers riding carts over walking, don’t make an unnecessary sacrifice and go as comfortable as you can get! Sketchers and New Balance are great options for pure comfort. Just beware — rain is not your friend! What level of quality am I looking for? As you probably know, it’s easy to get into the four digits when spending money on golf. But, there are also bargain options for the lower budget players. This is the most important decision you’ll have to make when considering a women’s golf shoe, because it will help you understand which brands to consider because nowadays, most brands have different shoes for every need. FootJoy is a great example — they have their classic waterproof leather model, but they also have the spikeless comfort option in their Leisure collection. Not to mention, they even have a sandal option for ultimate comfort! As far as cost goes, this would be within the mid-range, sitting at $85-$200 for a pair. So, when looking for your perfect golf shoe, set your foot down on your perfect budget, and find brands that fit within your criteria. We are in a world now where there is a shoe literally for every player imaginable, so don’t feel like you’re missing out on anything because of your bank account. Don’t Forget: What is your style? There are all kinds of styles seen on the golf course. From the bright colors and wacky patterns, to a more minimal style with neutral tones and simple lines, there’s a shoe to match every kind of outfit. Rocking the traditional leather FootJoy’s with zebra print pants, or bright pink and green shoes with a white golf dress may not be the best option. For the sake of fashion, it’s good to consider fluidity from head to toe. If fashion is your number one priority, did you know luxury brands are sneaking into the golf space? Tory Burch’s sport line, appropriately named Tory Sport, has a patent leather slip on number that would easily impress all of your playing partners. Rock these with a fitted polo/sweater combo and plaid pants, and you’ll be the definition of class. Feeling a little more athletic? We’ve all seen those high tops on tour from the likes of Michelle Wie and Rickie Fowler, but while those occasional limited edition models are hard to find online, the “athleisure” movement is still in motion and can be found across several brands. Puma offers their classic design in a spikeless golf shoe, which would perfectly accentuate the athletic/casual look you may be reaching for — and the suede is waterproof! Consider the dress code at your favorite club: are there certain restrictions on what attire you can wear? Watch to learn more on dressing appropriately for the golf course. Always try the shoe on and consider going a size larger. Cramping your toes on the golf course for four or more hours is the last thing you want to do. Worst case scenario is you could wear a thicker sock. If traction and stability is a concern, make sure to walk around on carpet, as that slightly resembles the effects of grass terrain. 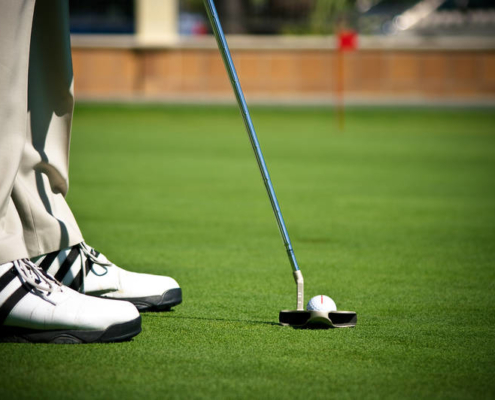 If you want, take it a step further and swing a club with them on, to see how they cooperate with your swing. In addition, you can also purchase a shoe bag, to further the longevity of the shoes even more! There is certainly a lot to consider when searching for the perfect golf shoe. Now it’s clear that you may have more than one pair in your artillery, but it’s important to take the time and do your research. After all, golf is a sport, and the performance of your shoe is important. Not only will you look good, but you should feel your best, which will absolutely create room for improvement in your game. By considering comfort, durability, quality and style, you’ll be able to pinpoint the perfect shoe and narrow down your options. However, as women in golf, it can be difficult as the options are narrow, compared to the men’s market. As you begin your search, don’t be surprised when you find brands with men’s shoes with top of the line technology sitting at a higher-end budget, and the women’s line of shoes cannot be compared. Alternatively, women’s shoes are often marketed as “comfortable” and “budget-friendly,” offering no variance from that preference. However, as discussed in this article, the gender disparity is steadily decreasing and there are more for women, but don’t think your only option is the $50-pink-comfort sneaker. There are so many options for women in 2019, which is worth an applause and a moment for appreciation. But again, if you do your research and stay confident with your priorities, you will certainly find options for quality women’s golf shoes. Honorable Mention: Ecco — This brand is extremely comfortable and durable, and they are coming out with more styles and designs each year.